24 ½ x 29 ½ in. (62.2 x 74.9 cm). William Carrigan, K.C., by 1941.
with Cynthia O'Connor Gallery, Dublin, 1979, from who acquired by the present owner. Dublin, Hugh Lane Municipal Gallery of Modern Art, Centenary Exhibition, 1941, no. 30, lent by William Carrigan, K.C. Dublin, National Gallery of Ireland, James Arthur O'Connor, 1985-1986, no. 58. 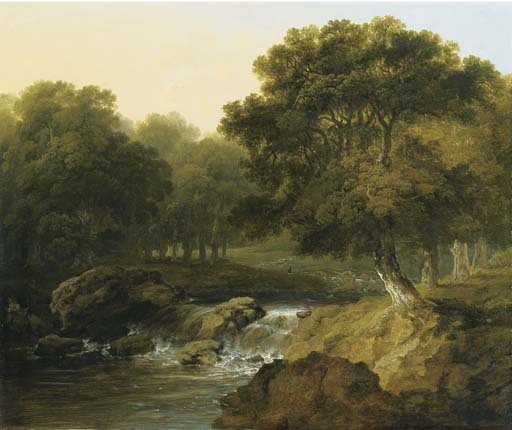 In the catalogue for the exhibition of O'Connor's work at the National Gallery of Ireland in Dublin in 1985-86, John Hutchinson commented that this was 'one of O'Connor's Dutch-inspired woodland scenes ... probably the kind that O'Connor was exhibiting at the Royal Academy and British Institution during the second half of the decade' and remarked that 'Other artists with whom O'Connor would have been competing for sales were Callcott, Lee, Chalon, Delamotte and Crome - all painters of similar picturesque scenes' (J. Hutchinson, James Arthur O'Connor, catalogue to the exhibtion at the National Gallery of Ireland, Dublin, 1985, p. 141, under no 58).